(VIP-NEWS) — Jazz legend Herbie Hancock and his band have set the dates for an extensive tour of Europe and the U.S. this summer and fall. Kicking off in June, the international outing will be the Grammy Award-winning artist’s first such full-band tour since 2011. Hancock’s all-star band features Vinnie Colaiuta on drums, James Genus on bass, Lionel Loueke on guitar (through Monterey) and multi-instrumentalist Terrace Martin. 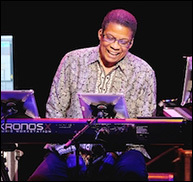 Stateside stops include New York’s Beacon Theatre, The Kennedy Center in Washington, D.C., the Hollywood Bowl in Los Angeles and the Monterey Jazz Festival, when Hancock will be honored at the annual Jazz Legends Gala. In addition to selections from his vast catalog, Hancock will give fans a preview of his next album, which he`s been recording for the past several years.